Last week I was driving a bit fast on the Parkway and got zapped by a State Trooper – 80 in a 55 = a $220 fine and four points, apparently. Which is not too cool. After getting some free advice from one of the guys at Hackensack, I’m going to show up in court and try to pay down the points. So I got over to mom’s to pick up some mail and say hi – and I find I have no fewer than nine letters from lawyers offering their assistance in the case. It seems that the “Open Public Records Act (NJSA 47:1A-1) shows that [I] have been charged for violating NJSA 39:4-98.29 (Exceeding By 25-29mph) in the Clifton County Municipal Court.” These guys obviously troll the public records looking for new clients, which, in my humble opinion, doesn’t exactly recommend them as outstanding lawyers. All these attorneys offer free consultations, but also make it clear that they accept ALL MAJOR CREDIT CARDS. Thanks, but I don’t think so. Nelson won the Masters twice, the P.G.A. Championship twice and the United States Open once. His triumphs in those five majors were among his 52 tournament victories, placing him No. 6 on the PGA Tour career list. 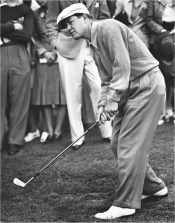 His 18 tournament victories in 1945 remain a single-season record. During a seven-year stretch in the 1940s he made 113 consecutive tournament cuts, a total exceeded only by Tiger Woods, who passed him in 2003. He was named male athlete of the year for 1944 and 1945 in an Associated Press poll of sportswriters and broadcasters. They should have added there (they did later) that part of those 18 victories in 1945 made up a stretch of 11 consecutive wins. Both records still stand, and will probably stand for all time. No golfer has come close to either. The great Sam Snead “only” managed 11 in one season, and Tiger, in all his glory, has only gone as far as six straight – impressive feats, nonetheless. And I believe Tiger has gone 6 in a row twice. But nobody has touched 11 and 18, and I doubt they will. Another noteworthy part of the article says that Byron Nelson was once an assistant pro in my hometown of Ridgewood, NJ, at the storied Ridgewood Country Club. Actually, the RCC is in Paramus, but hey, what can you do. Nelson’s winnings in 1945 - about $63,000 in war bonds - enabled him to buy a 740-acre spread in Roanoke, near Dallas, that he named Fairway Ranch. It became his home for the rest of his life. I’ll raise my glass to that. Nelson hit the ball so straight, the caddies there once challenged him to try to hit the flagpole about 100 yards away across the practice green from the slate deck outside the pro shop. Together, the caddies put up about 55 cents. They put down three balls on the deck and gave Nelson three shots to hit the flagpole, which was about six inches wide.